Mount Vesuvius, perhaps the world’s most famous and deadliest volcano, erupted on August 24, AD 79, destroying Pompeii and Herculaneum and killing some 25,000 people. Because of its explosiveness and the nearly three million people who live virtually within its looming shadow, Vesuvius remains extremely dangerous. 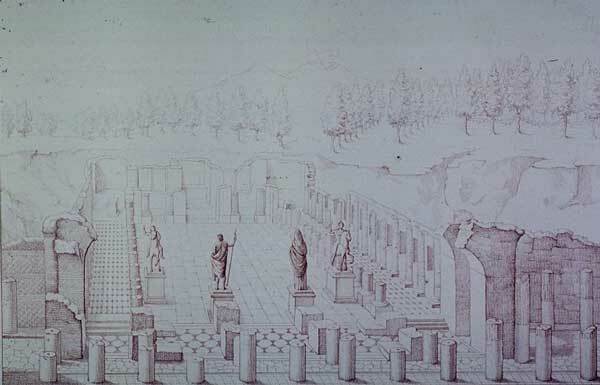 The image below is an undated engraving, Greco-Roman House, depicting the excavation site in Pompeii, possibly of a doctor’s house, with Vesuvius erupting in the background. You can view this and more historical images by searching the Images from the History of Medicine database.